- EUR rally in pipeline now China is recovering says Nordea. - As Asian financial conditions loosen, EURUSD should rise. - Bank of America technical analysts look for even larger rally. The IHS Markit and China Federation of Logistics and Purchasing manufacturing PMI surveys both suggested at the beginning of April that China's factory sector exited recession in March, with a months-long government effort to stimulate the economy at last looking as if it's bearing fruit. People's Bank of China data revealed last week that Chinese loan issuance almost doubled during March, after having fallen sharply in February, while the trade surplus also rebounded from depressed levels too. Not everybody is convinced that is good news though. "So is it any wonder Chinese stocks are up so much this year, and that a property market saddled with 65 million empty homes is gearing up for another dangerous surge higher in prices and construction? 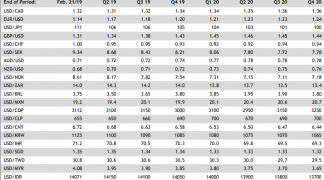 Yet what’s scariest is that China’s imports were still DOWN 7.6% y/y in March even as exports apparently rebounded 14.2%; and the overall pick-up in actual GDP growth has been modest at best," laments Michael Every, a strategist at Rabobank. Every and some other analysts appear to be of the view that the government's decision to slash bank capital requirements and pump more cheap money into the financial system will eventually come back to bite it and the world economy, but the currency team at Nordea say the present recovery could be positive for the Euro in the short term at least. They argue in their weekly market outlook that the economic growth differential between the U.S. and the rest of the world is one of the most important drivers of exchange rates, and that this explains the outperformance of the U.S. Dollar over the last 12 months or more. A recovering Chinese economy will narrow the growth differential and undermine the big Dollar, Nordea says, enabling the Euro to get out from under its thumb. "It is important how the US’ outperformance gap closes, if US growth crashes, it could still be good news for the USD because of the dollar smile, but the US has remained resilient - and perhaps Trump’s deregulation will keep it so. 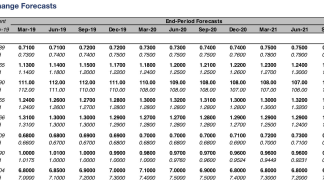 The green shoot narrative is therefore probably also supportive of a bounce in EUR/USD, but so far, we have only opted to highlight that scenario," says Martin Enlund, chief FX strategist at Nordea. "At some point one though must put the money where the mouth is and hence we go long EUR/USD." Above: U.S.-rest-of-world growth differential. Source: Nordea Markets. Differentials in economic growth rates matter to markets because of what they could mean for inflation and the interest rate policies of central banks in different parts of the world. It is the interest rate differential that is anticipated in two years time that matters most for individual exchange rates. The entire time the U.S. economy is growing faster than the rest-of-world economy, which is dominated by China and the Eurozone, markets could view the more advantageous interest rate situation in the U.S. as something that is likely to endure and therefore, the Dollar could remain supported. And if U.S. economic growth was to fall sharply at a time when the rest of world economy was also on its back foot, the Dollar could again remain supported due not only to its safe-haven status, but also because such a downturn would also eventually hurt economies elsewhere, further entrenching the Dollar-supportive interest rate differential. In fact, it's possible that Dollar strength could only be sustainably undermined by a situation where the rest-of-world economy recovers from its 2018 slowdown at the same time as the U.S. economy decelerates further. In that scenario investors might be willing to bet against the Dollar on an ongoing basis because a growth upturn in Europe or China would give hope of an eventual increase in interest rates in both areas, at a time when financial markets might be betting more heavily on Federal Reserve (Fed) rate cuts. "As of 2018Q4, US growth was outperforming the rest of the world at its strongest pace since summer of 2015. And relative growth can be a leading indicator of the USD," Enlund writes, in a note to clients. 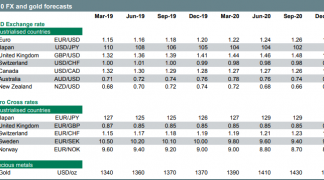 "What could help EM FX and more materially dent the USD would be if RoW growth finally starts to pick up vs US growth, and thus start to close the US’ outperformance gap." Above: EUR/USD correlation with Asian financial conditions. Source: Nordea Markets. Enlund highlights that there is a close correlation between the Euro-to-Dollar rate and Asian financial conditions. Financial conditions are a broad measure of support provided to the economy by exchange rates and different kinds of interest rates, as well as the stock and housing markets. The sharp increase in Chinese credit creation seen during March is very supportive of Asian financial conditions and suggests that, in the short-term at least, the Euro-to-Dollar rate could be headed higher. Enlund has a target of 1.1650 attached to his trade idea and a stop-loss set at 1.1187. Technical studies of the exchange rate, from Bank of America Merrill Lynch, also support the idea of some upside for the Euro over the short-term. Bank of America says a "double-bottom" may have formed on the charts and the market might rise even higher than Enlund has projected. Above: Euro-to-Dollar rate technical analysis. Source: Bank of America. 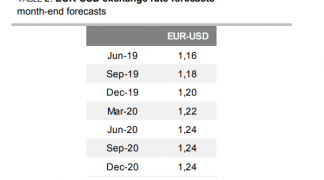 Ciana says the Euro-to-Dollar rate has the potential to reach 1.1719 during the coming weeks and months, based purely on technical studies of the charts, but caveats this forecast. If the Euro breaks above the 1.1360 level then it must also overcome the 1.1448 threshold to maintain its upward trajectory and have any hope of hitting 1.1719. Bank of America's above projections take account of technical factors only whereas Nordea's trade idea is heavily dependent on a Chinese economic recovery developing further over the coming weeks and months, but other analysts are sceptical of suggestions that this Chinese rebound is in any way sustainable. "According to PBOC Deputy Governor Chen Yulu at the Washington meet-up. But he would say that, wouldn’t he? And note the ‘teenage scribblers’ have been cheerleading both the Chinese borrowing data AND that PBOC “prudent” statement. I’d say that’s Orwellian but I don’t think they’d know what Double Think means," Rabobank's Every writes in a note to clients Monday. China's economy was badly damaged in 2018 by a tariff fight with the U.S., which is thought to be coming to an end now after months of negotiations. The current official line is that a deal to avoid further tariffs and address U.S. concerns over Chinese trade practices will be agreed over the coming months. The Euro-to-Dollar rate was quoted 0.12% higher at 1.1312 Monday but is down -1.36% for 2019.